"Wonderful change to a plain old quesadilla. Sweet, salty and barbecued! Use any type of firm red apple. Additional options: add barbecued chicken or chopped jalapeno peppers. Serve warm with sour cream, salsa, guacamole or all three." Brush oil onto one side of a tortilla, and place on a plate oil side down. 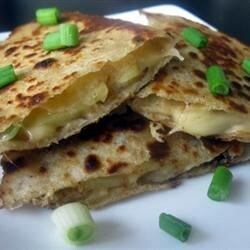 Spread about 1/2 tablespoon of mustard on the top side, and top with green onion, apple slices and about 1/2 cup of shredded cheese. Place a second tortilla on top, and brush the top with olive oil. Repeat with remaining ingredients, stacking the quesadillas on the plate. Brush the grilling surface with oil, and place the quesadillas carefully on the grill. Grill for about 3 minutes, or until the bottom is crisp. Flip, and grill on the other side until crisp. Remove from the grill to serving plates and cut into quarters. Serve warm. One word: Bland. This was not good I won't make it again, it lacked flavour. This is a wonderful lite meal. I think I will probably add a few more green onions next time. I used smoked gouda and it was wonderful. This recipe is a definite keeper! A great and innovative recipe but I would probably leave out the mustard which I found overwhelming and change the simple Gouda to a stronger cheese like the goat's milk gouda Arina or Fontina. What a wonderful change to the regular barbeque fair. This was served at a party I recently attended and everyone loved them, great recipe. I tried this recipe on regular pan on the oven. Works great. Very easy to assemble. Tastes yummy!